Shyamarupa dasa first came in contact with the Hare Krsna movement in the autumn of 1986. The devotees were on Harinama in Chicago's Rogers Park, distributing prasadam, the Atma Magazine, as well as chanting the Holy Name. Being attracted to the chanting, he began to attend temple programs regularly, and has participated in the Boston yatra since 1992. 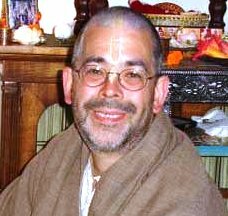 Shyamarupa dasa has been accepted by Srila Niranjana Swami as a disciple and was given first initiation in 2005, and second initiation in 2015.